Hilda Matos at her home in Palao, a shantytown on the outskirts of Lima, where she awaits the visit of a community health worker from Socios En Salud, Partners In Health’s sister organization in Peru. The worker makes sure Matos follows her treatment for XDR-TB, a type of tuberculosis extremely resistant to medication. 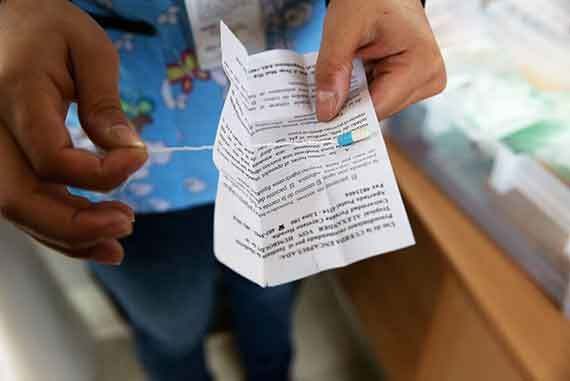 LIMA, Peru — On a foggy July morning in a shantytown on the outskirts of Lima, Peru, Hilda Matos waited impatiently for the nursing technician who gives her daily injections and medicine to treat the disease that has had hold of her for the past eight years. A mother of four and a former housemaid, Matos, 44, has extremely drug-resistant tuberculosis, an ailment that until recent years was considered a death sentence. 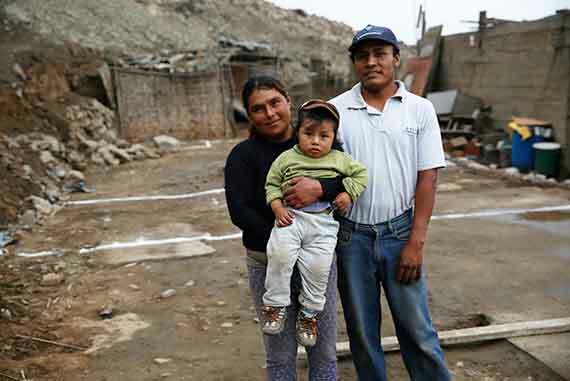 But through pioneering work developed by Socios En Salud, the Peruvian branch of Harvard-supported Partners In Health, which began treating multidrug-resistant TB with a community-based model, Matos’ fate can be different. What changed Matos’ prospects was a novel protocol in which trained community health workers visit patients in their homes to make sure they take their medication until they are cured. The protocol was something that Paul Farmer, co-founder of the nonprofit Partners In Health and the Kolokotrones University Professor of Global Health and Social Medicine at Harvard Medical School, had used in rural Haiti. It proved effective in the slums of Lima, too. Patients recovered under the attentive eyes of community health workers. Previously, treatment for multidrug-resistant TB in developing countries was nonexistent, and many patients were left to die. The World Health Organization has adopted a treatment plan based on Peru’s example. Recruiting health workers to help fight drug-resistant TB in its two forms, multidrug-resistant (MDR) and extremely drug-resistant (XDR), has been the group’s main contribution, said Leonid Lecca, physician and executive director of Socios En Salud. 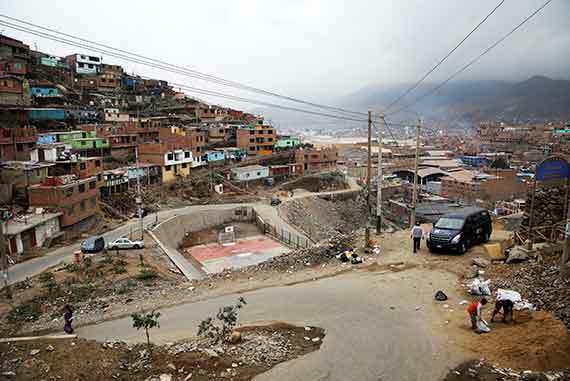 Carabayllo, the shantytown in Lima where Socios En Salud started its pioneering work 19 years ago treating multidrug-resistant tuberculosis (MDR-TB). Using a community-based model since 1996, the organization has helped more than 10,000 MDR-TB patients. 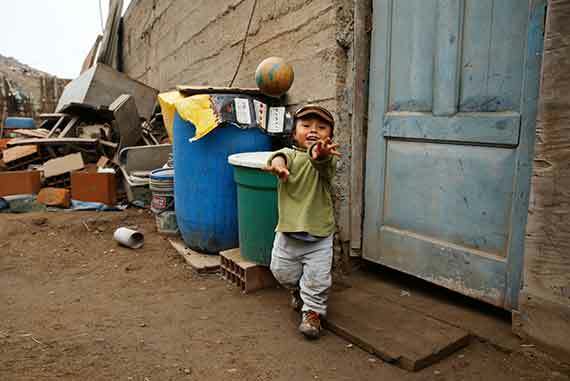 To improve TB diagnosis among children, the organization launched pilot DETECT-Niños. A probe placed in a child's stomach to collect saliva helps doctors detect TB. Parents Rebeca Cruz and Angel Reyna with Rafael, the youngest of their three children. A community health worker trained Rafael's parents in how to stimulate him through reading, singing, and playing. Reyna Cruz, 2, overcame his shyness and language delays after he received help from Socios En Salud as part of an early childhood development program. Like his brother, Rafael, more than 120 children at risk of developmental delays have been helped by Project CASITA, a program Socios En Salud started in 2013. In Peru, where a third of the population of 30 million lives in poverty, every year tuberculosis affects 33,000 people and kills 4,000. Of the affected, 1,200 cases are MDR TB and about 80 are XDR. 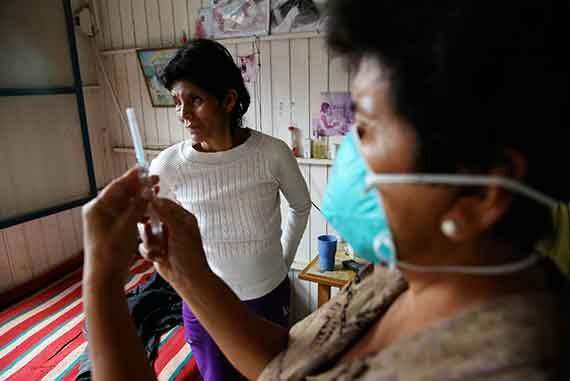 In 2010, Peru had the highest number of multidrug-resistant TB cases in the Americas. Although over the years the number of deaths from tuberculosis in Peru have declined and detection and access to treatment have improved due to the work led by Socios En Salud, there is still much to do. Despite Peru’s booming economy that has lifted thousands of people out of poverty and into the middle class, tuberculosis is far from conquered. In Carabayllo, the impoverished district where Socios En Salud started its revolutionary work 19 years ago, TB cases are on the rise. To eliminate tuberculosis in the district, the organization launched the TB Zero program a few weeks ago with the support of the local municipality. To help cure patients, the organization provides free medication, food coupons, and even small business training and micro-credits to help patients make a living. Sometimes, patients have their modest houses remodeled to make sure they meet sanitary conditions. The group has joined forces with the Peruvian Ministry of Health to treat multidrug-resistant TB. It’s a partnership that allowed Peru in 2012 to achieve a higher cure rate in MDR TB (75 percent) than the rest of the world had (48 percent), according to the World Health Organization. Even driver Javier Yataco, who has worked for Socios En Salud for 13 years transporting patients from their homes to health centers because they’re too sick to walk, has noticed the changes. For Karim Llaro, who is in charge of the programs in Carabayllo, the key to success is the community-based model. At her modest home, perched precariously on a rocky hill, Matos, who’s halfway through her two-year-long treatment, agrees. She greeted Bertha Huaman, her nursing assistant, with a hug and a kiss on the cheek when she arrived (late, because of the traffic jams that clog Lima’s roads). As Huaman gave an injection to her patient, Matos’ face contorted in pain. “Before I got sick, there was no pain in my life,” Matos said. "The MOOC classroom is like no physical classroom on Earth. It has lowered boundaries for learning in space and time. As a result, we don’t just have many learners, but incredible diversity and asynchronicity," said Andrew Ho, a professor at the Harvard Graduate School of Education and chair of the HarvardX research committee, and Isaac Chuang, MIT professor of physics, professor of electrical engineering, and senior associate dean of digital learning.